Honey Bee Whitney heads for the finish line. 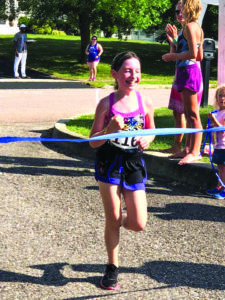 Alex Montgomery and Hannah Wolny ran in the 10-12 age group. A group of age 7-9 swimmers wait for their swim heats. 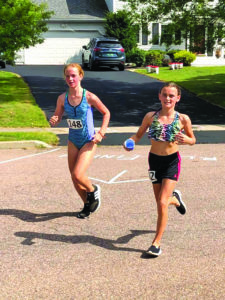 Residents in the Indian Ridge neighborhood came together Labor Day to throw an inaugural triathlon that they hope to make an annual event. 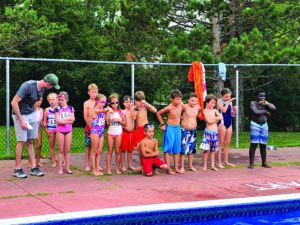 The Indian Ridge Kids Triathlon included about 50 kids in three age groups. The event included a swimming leg in a neighborhood pool followed by a bike and run on neighborhood streets. Parents and spectators lined the streets to hand out water and provide relief with lawn sprinklers. “It was bigger than we expected,” said organizer Jill Spinelli.